I use one constantly to gauge the level of my performance so I can identify weaknesses that I must address. If we take the element of time away, all of this is easy.. The element creating the greatest degree of difficulty in any of this, competition, defense etc is the time element. If we had all day to analyze, decide and shoot, anyone could do it. In real life, as in competition, time is a factor and doing it “fast enough” is critical. The timer helps one know how fast one is actually going. I hate to beat this horse again, but it ain’t dead yet! In drumming, OUR “shot timer” is the metronome. The relationship between shooting and drumming is AMAZING! I see it regularly because I am passionate about, and do both. Much like the shot timer, the metronome is a tool to gauge progress. NOT just to play passages FASTER, but to gauge how fast you can play passages while remaining fluid with note placement OR remaining “ACCURATE”. Speed and precision are huge factors in drumming just as they are in shooting. The balance between the two is CRITICAL for both. Playing a passage fast means nothing if the notes being executed in the process are not spaced precisely and placed accurately. Much like presenting a firearm rapidly, but not executing combat accuracy with your shot placement. The idea while learning a “drum lick” is to play your passage slowly with a metronome to keep you on point with your time. Then gradually increase the metronome speed to find the threshold where playing the passage starts to feel uncomfortable. You STAY at that tempo until it becomes comfortable and then once again, gradually increase speed. The metronome is an AMAZING tool to help progress where the balance of speed and precision are paramount. 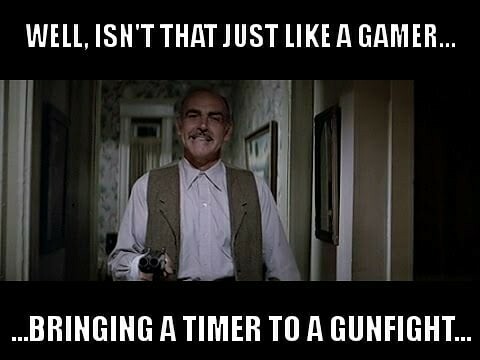 This is why I have brought the metronome into my firearms training. In particular for presentation from the holster. I use a 4 step presentation. Each click of the metronome is a step in the presentation. I start with the metronome very slow and run some reps.Then I gradually increase. This keeps the space between steps equal. By the time I get “up to tempo”, meaning as fast as i can go while maintaining combat accuracy, my motion is very smooth. The motion becomes very close to being on “auto-pilot”. Not thinking about the steps anymore, just about the fluid motion. Like the shot timer, the metronome will NOT be there in a DCI, but it the practice realm, its an incredible tool for developing skill and making progress!! BTW…I discovered after the fact, that there are some folks on YT that use a metronome as well. I just use mine a bit differently. I use it with a bit more complexity. Subdivisions, etc, like I do in the drumming realm. Clint Smith, owner of Thunder Ranch, and his take on participating in competitive shooting.